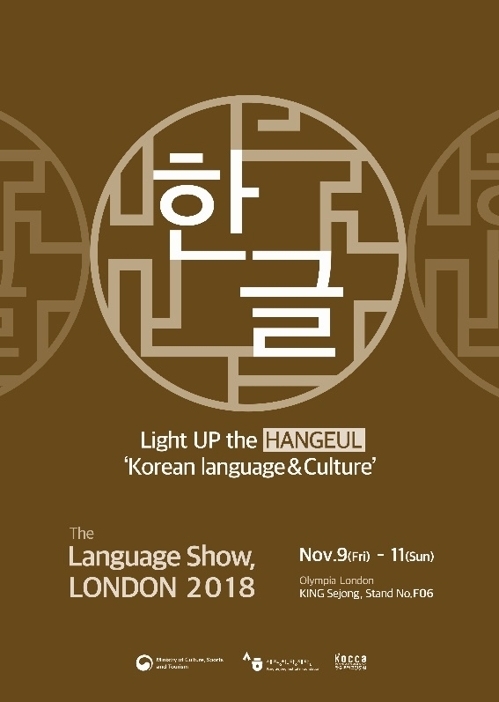 A Hangeul booth will be set up at The Language Show exhibition, Europe’s largest language event, which is being held from Friday to Sunday in London. Korea’s Ministry of Culture, Sports and Tourism said Thursday it would run a Hangeul exhibition booth together with the King Sejong Institute Foundation at Olympia West Hall in London. The Hangeul exhibition will promote Hangeul, Korean and Korean culture under the theme “Light up the Hangeul, Korean language & Culture.” A variety of educational materials, cultural products and Korean-related educational contents developed by KSIF will be on display. There will also be events such as Korean language lessons for those planning to travel to Korea, K-pop performances and traditional Korean music performances. Some 100 institutions are participating in this year’s The Language Show, offering exhibitions, educational seminars, language taster classes and cultural performances.